I was alone in my van, driving up from Babylon after two nights, a full day, and a morning in the heat. I was tired because the heat had kept me from getting good rest. It was early afternoon, full daylight, and although my van is a lumbering beast, I was making good time up the mountain. Most of the road was well-lit by the sun, but where tree branches hung over the asphalt, shadows darkened the edge of the road. With my sunglasses on, it was sometimes difficult to see what was lurking in those shadows. I’m generally a cautious driver, and I tend to be even more careful on mountain roads. However, I almost had big trouble that afternoon. I was taking a curve, and the road immediately ahead of me was deep in shadows. I was maybe going a little faster than I should have been. Maybe I had looked off to my left, or maybe I was daydreaming a little. I don’t remember what I was doing before I realized something was lurking in the shadows, but I do remember the panic and fear I felt when I realized something was out there. It was a calf, and it bolted. Instinct caused me to swerve into the other lane to miss hitting it. At first I didn’t think I had swerved fa r enough, and I worried I might hit the calf with the back of my van. Then I saw the calf running in the direction I was going and knew it was ok. I stayed in the wrong lane long enough to bypass the calf, then swung the van back into my lane. Once I was away from the calf, I thought about the way I had swerved the van into the other lane without even looking to see if another vehicle was there. Luckily there wasn’t a vehicle in that lane, but what if there had been? What if someone had been coming from the opposite direction and had plowed into me because they were traveling too fast to stop? I silenced my worried thoughts. It wouldn’t do any good to work myself into a panic over something that was finished. Just be more careful, I reminded myself. What really mystified me was why that calf was alone. The bovines in that area usually hung out in groups of half a dozen or more. I occasionally saw a grown cow alone, but never a baby. I think I would have seen a grown cow more easily in the shadows. I certainly would have been going slower had I seen a cluster of cows on the road or by its side. In any case, the baby’s mamma was not there doing her job, and she and I both nearly paid the price. I listened to my own advice and was more careful the rest of the way back to my campground. I especially slowed down and took a good look any time my side of the road was cloaked in shadow. When I was in middle school, my parents went on a camping kick. I suspect it was my dad who decided the family should go camping. Why would my mom want to camp? It only made extra work for her: making sure everyone in the family had packed everything s/he needed for the weekend; packing every ingredient for every meal, as well as appropriate pots, pans, and utensils; listening to the children complain; gathering and packing necessary bedding and towels; washing sand out of everything when we returned from the beach. It was to the beach we went on our first few camping trips. This beach was not a white-sand beach in Florida or the ruggedly beautiful coast of Oregon. No, the beach we frequented was the nasty oil-slicked beach of the Louisiana Gulf Coast where the water was brown, trash washed up on the sand, and the mosquitoes were huge. This beach was ugly, but it wasn’t very far from home, and camping there was free. Our first camping shelter was an old-school canvas tent. I suspect my dad got it, like so many items from my childhood (scratchy wool blankets, BAND-AID® brand adhesive bandages in bulk, Mercurochrome) from a discard pile of mythic proportion from his days in the National Guard. After a few trips to the beach, my dad liked camping so much, he decided to buy a tiny camper to pull behind the family truck. He bought the camper from an old couple, and it was only after he got it home that he discovered the pressboard it was made from was mostly rotten. My father dismantled the camper down to the frame, then replaced every bit of wood and every scrap of insulation before putting it all back together again. As far as I was concerned, he could have saved his energy. I had no desire to camp. There were no showers at the beach, no hairdryers, no flush toilets. To young teenage me, the beach was barbaric. I can’t remember how many times my family went camping at the beach in our refurbished camper. I only remember the night of the half-wild beach cows. A friend of the family had come with us. She was in her 60s, flamboyant, liked board games, and was patient with my sibling and me. I have not idea why she wanted to spend her weekend at the beach. The family friend was supposed to sleep in the screen ten, but my dad built the campfire too close to it and melted the screen. No way could she sleep in a tent with a huge hole in it; the mosquitoes would have carried her away. Instead, she had to sleep in the camper with us. It was already tight quarters in the camper at night. The kitchen table folded down into a double bed; that’s where my parents slept. My younger sibling slept in a bunk that folded down from above the table. (My mother was afraid my sibling–a tween at the time–would roll out of bed and meet death on the camper’s floor, so she crocheted a huge net to stretch across the bunk.) I usually slept on the cushioned bench across the front of the trailer, but on this night I was relegated to a pile of blankets on the floor so our elderly guest could have what barely passed for a twin bed. If I was uncomfortable–and I was–I wonder how our rather large friend managed to stay on her narrow bed. No one was sleeping well when the commotion started outside, but we were soon wide awake. We heard animal noises and hooves hitting the ground, and it was all very close. It was so close, we began to hear and feel thumping on our camper. The camper swayed and rocked as one or more big somethings bumped it. In the distance we heard humans yelling. What could possibly be going on out there? My dad must have grabbed a flashlight and shined it out the window in order to report: cows. They were half-wild beach cows, let loose to graze, I suppose, although there wasn’t much in the way of tasty grass where we were parked. It must have been open range out there, and the cows were allowed to move about freely on the beach. We had come into their territory, and they seemed none too happy about it. I don’t remember how long the attack lasted, but we couldn’t get back to sleep after the cows moved on. I don’t think any of us got much sleep that night. In the early daylight of the next morning, when we emerged from our little trailer, we saw the aftermath of the visit from the cows. Tents and temporary clotheslines had been knocked down. People must have spent a long night in cars to escape mosquitoes and marauding bovines. What else can you do when half-wild animals knock your tent on top of you while you’re sleeping in it? My family had been lucky to have a sturdy camper to keep us safe. Images courtesy of https://www.pexels.com/photo/black-white-mosquito-86722/ and https://www.pexels.com/photo/animal-black-and-white-cattle-close-up-551618/. Thank you to Blaize for allowing me to guest blog for her today. We met Blaize while camp hosting in Sequoia National Forest this summer. We (Jeremy & I and our 2 dogs Dakota & Crosby) traveled from Ohio to California and now are staying in Taos New Mexico. We live in a converted school bus and are enjoying our traveling adventures! 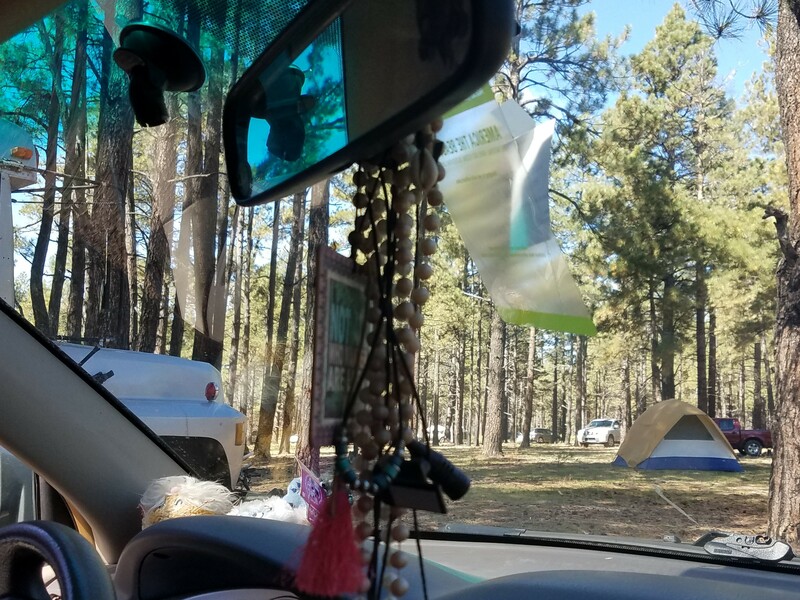 I do not currently have a blog but I do write and the following is something from our stay in the Coconino National Forest near Flagstaff AZ. We camped there almost 2 weeks and most days we had a huge area all to ourselves…but not this day. Tent pitched too close to the author’s bus, viewed through the windshield. I woke early. The first up actually. Don’t gasp! It happens, regularly even since being on the road. I think I am still operating on Ohio time, or perhaps I’m more in tune out here. Getting up closer to sunrise, going to bed early…not too long after dark. That, however, is beside the point. As I said I woke early. Usually I have my coffee and sit on our front porch, aka driver seat of the bus, and enjoy my three-sided view of the forest, scanning for wildlife in the growing morning light. Not this morning. This morning I have woken to the multitudes of squealing children. “Boy Scouts, why’d it have to be Boy Scouts?” I mutter in the spirit of Indiana Jones. I roll over. It appears we have been invaded by a family troop excursion. Dozens of tents and pick-up trucks now dot my view. One in particular has set up their tent not 50 ft from the front of our bus. Seriously? There are acres and acres of open space here. He has set up closer to our bus than to his own group. Camping etiquette folks: Give a camper their space! The group arrived yesterday while we were doing “town” stuff. I almost wish we had been here when they arrived. Surely the barking of my dogs would’ve encouraged a respectful distance. Maybe Crosby will pee on their tent which has so obviously been placed within his territory. Actually that prospect is pretty likely. The thought makes me smile and consider letting him out and maybe not watching him too close for a minute. A wave of guilt passes over me and then quickly recedes as a pack of wildings run squealing through our camp. Boy Scouts always conjure up images of Lord of the Flies for me. It’s unsettling. In the woods they are downright frightening. I’d rather camp next to a pack of wild coyotes than in the midst of a group of Boy Scouts. Suddenly an angry low of a cow cuts through my thoughts and the melee of the boys. If you don’t think a cow can sound angry you’ve not spent time around wild forest cows. Out west cows roam everywhere, especially on National Forest land. Around any given corner you can encounter a cow standing in the middle of the road. Many of which have large horns…and attitude. This one sounded very angry. Not the gentle moo of a cow contentedly chomping grass, but an almost roar. Think bear growl crossed with a moo. This cow was seriously pissed. Rounds of squealing Boy Scout ruckus followed the bellow, and then more angry moos. I can visualize the wild pack of boys harassing the cow. I can hear the cow getting angrier and angrier. Oh this is going to end badly. More squealing, more angry moos. Suddenly a whistle blows long and hard. Still squealing and angry moos continue. Another whistle blow and the squealing abates. Another angry moo or two. Evidently an adult has finally stepped up to control the situation. The whistle serving as a sort of code to call in the wildings. A dark side of me is disappointed. The karma of a cow trampling through their camp seems almost appropriate. There are a few moments of silence and then the ruckus begins again, without angry moos. The cow must have moved on, probably as perturbed by her unexpected visitors as I am. I pour my coffee and remind myself that the forest belongs to us all. Wildings, cows and buslife hippies alike. Later that afternoon I breathe a sigh of relief…they are packing up. Just a one night trip. We have our peaceful forest back, the cows are pleased. The author took the photos in this post. 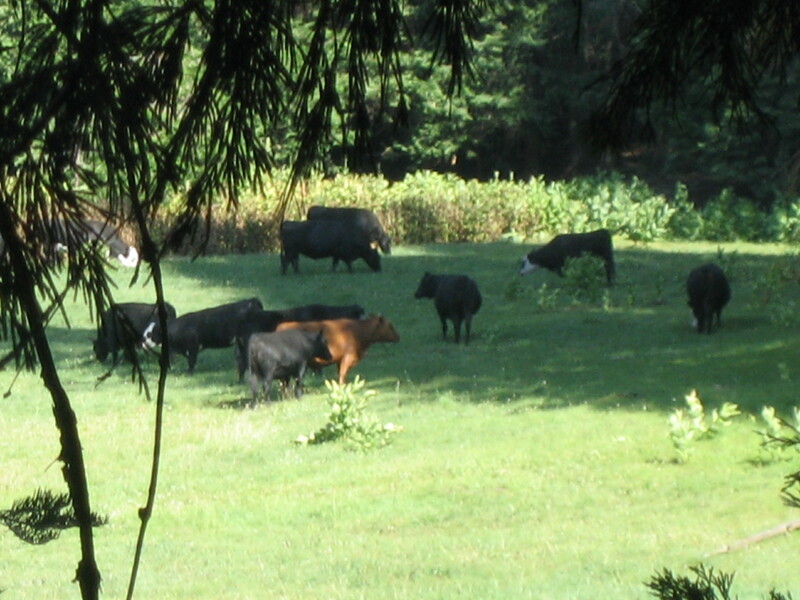 Last season there were cows in the meadow bordering my campground–not just one or two cows, but a lot of cows. How many cows does it take to make a herd? I don’t know, but I think there was probably an entire herd in the meadow. For most of this season, only a couple of cows spent time in the meadow, and only briefly. That was in June. Both cows were black. One was huge and had a white face. The other was smaller–maybe a teenage cow. They looked at me inquisitively as I walked by on the dirt road leading to the campground. The cows were gone the next day. I have no idea where they went. Last season, the cows in the meadow chomped down all the grass and either ate or trampled the corn lilies. If any wildflowers began to grow, the cows ate them before they bloomed. Those cows kept the vegetation short. Last summer, the meadow looked as if it had been mowed. 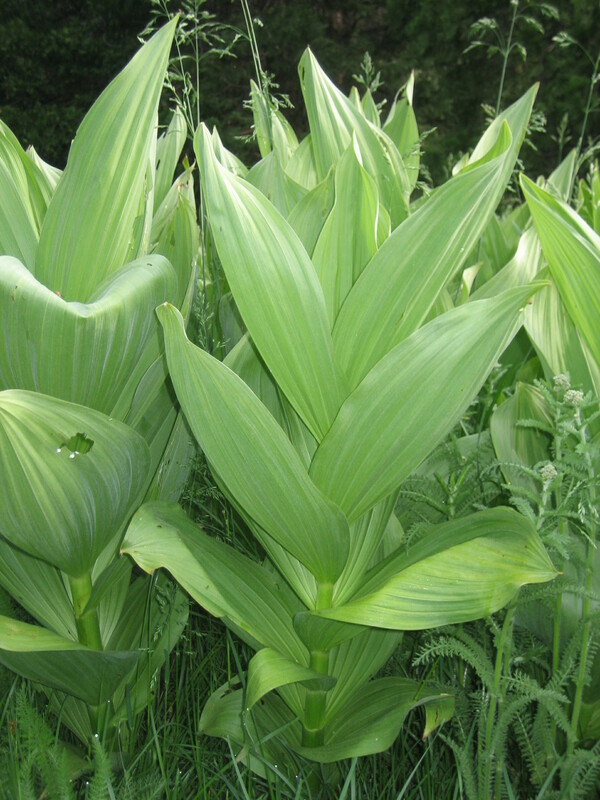 Corn lilies growing in the meadow. This summer, the lack of cows in the meadow has lead to glorious grassiness. The grass has grown tall (above my knees). The corn lilies are tall too. Also, wildflowers are flourishing in the meadow. There are white flowers I think are Queen Anne’s Lace. 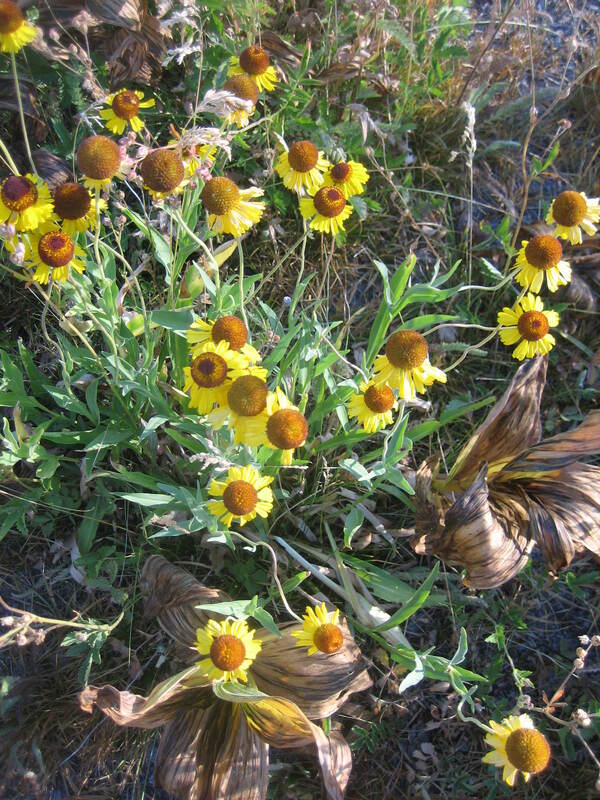 There are orangey-yellow flowers with brown middles–what we called brown-eyed Susies when I was a kid. There are purple flowers too, but I don’t know their name. Last year the cows moved in late in June or possibly in July. This season, June came and went, then July did the same and all I’d seen of the cows were the two black ones who seemed to have only spent one night in the meadow. Then one evening during the second week in August, there was another brief bovine visit. It was dusk. I was sitting on the floor of my van with the side doors open. I was making a hat and listening to a podcast when a noise outside my campsite caught my attention. There was one set of campers in the campground, with a site way on the other side, but the kids had been running around the whole place all evening. I figured it was them I was hearing. But when I looked up, I didn’t see any children. I saw creatures–big creatures–ambling in my direction. At first I thought the creatures were horses (and I imagined they were being ridden by cowboys), but pretty quickly, I realized I was seeing cows! There were four of them. Three were all black, but one had the all white face I’d seen earlier in the summer. They were on the road, heading in my direction. They were moving at a steady pace, not running, but moving briskly. I said something like Hello ladies, and they froze. I hadn’t yelled, just spoken in a normal tone of voice. That apparently was enough to stop them in their tracks. I wanted a photo of them, but I knew it was too dark for the camera on my phone to produce a visible image. I also knew that moving around to find my real camera probably would make these shy, half-wild mountain cows nervous enough to leave. No way would they stick around for another photo once the flash went off. So I sat tight. The cows regarded me calmly, but with suspicion. I watched them, curious to see what they would do next. Long minutes passed while we looked at each other. One of the campers must have been in the nearby restroom because a door slammed, and the noise was loud in the quiet of the evening. Three of the cows bolted. Their hooves thundered in the dirt as they ran toward the meadow. It was a very small stampede! The fourth cow didn’t seem bothered by the noise. It didn’t run at all, but instead followed slowly behind the others. I don’t know where the cows went, but I didn’t hear them in the meadow later in the night. The next day when I came back from the parking lot, I saw four cows near the front of the meadow. Where these the cows of the night before? Had they broken off from a larger group to form their own herd? The cows were gone again the next day. I haven’t seen them since. 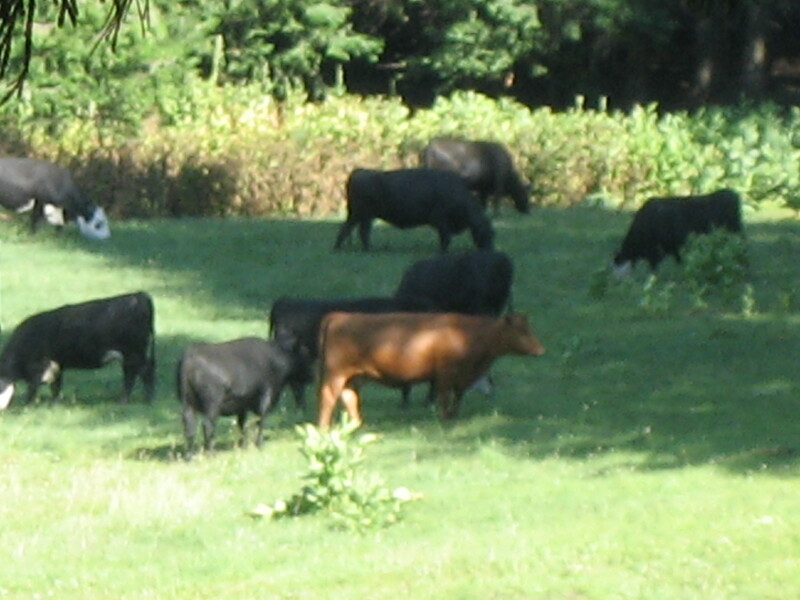 Cows in the meadow, summer 2015. When I went to bed, the campground was empty. I woke up at 12:30am, and I really had to pee. I was so groggy as I pulled out my pee bucket and found the toilet paper, but I seemed to be hearing noises in the campground. The noises weren’t right outside the van, but were somewhere within the campground. Once back in bed, I tried to figure out what I was hearing. I did not hear the sound of a vehicle’s engine, which kind of freaked me out. If there were people in the campground, wouldn’t they have driven in? Could I have slept through a vehicle pulling into the campground? Probably. As groggy as I was when I woke up, I’d probably been sleeping really hard. If the vehicle were on the other side of the campground, I definitely could have slept through its motor running. But what were the other noises I was hearing? There was a metallic sound, somewhat like the metal lids on the metal trashcans being jostled, but not very loud. I wondered if a bear were getting into the metal trashcans, but I think a bear messing with trashcans would make a lot of noise. I don’t think bears are carefully quiet when helping themselves to midnight garbage snacks. I could also hear the sounds of some kind of animal(s). I couldn’t decide what kind of animal it might be. Are the cows back? I wondered. When I’d closed up the van around eight o’clock, there had been no cows in the meadow. I don’t think cows are the type of animal to go exploring in the middle of the night. Besides, I’ve been around cows at night (me in a house or my van, the cows in a pasture or a meadow); I know what kinds of noises cows make. The noises I heard did not sound like cows. I was back to thinking maybe I heard a bear. I’ve never heard a bear, so maybe the noises I was hearing were bear noises. Maybe it was a very quiet bear, carefully lifting the lids on the trashcans and replacing them gently. What didn’t make sense about bears eating from the trash cans is that the campground had not been very busy in the last few days. Any bears exploring those trashcans would not find much to eat. Maybe I had dozed off. Maybe I was dreaming. But suddenly I was wide awake and I swore I’d heard a footstep. But whose footstep? Man or beast? Bear or cow? I waited to hear a lid lifted from a trash can or one can crash into another. Nothing. Nighttime in a remote, empty campground can be very disconcerting. It’s so quiet. It’s so dark. I never know who or what is out there. One of my personal rules of being a camp host is that I’m in the van with the doors locked by nightfall, and I don’t get out of the fan at night to greet strangers. If someone I already talked to and checked-in while the sun was out knocks at at night, I ‘d get out of the van and help them if necessary. But I’m not going to deal with strangers in the dark, especially if my brain is addled with sleep. I lay in the dark, still and quiet, straining to hear any and every little noise. Then I saw the beam of a flashlight once, twice. I was pretty sure even a Ninja quiet bear would not have a flashlight, which meant I was dealing with humans. I didn’t know if I preferred humans to bears. What were those people doing out there at nearly one in the morning? Who were they? Did they just want to camp, or were they plotting evil schemes? And what were the weird noises? Everything must have settled down, and I must have dozed off because the next time I turned on my tiny flashlight with the red beam, it was 2am and all was quiet. I was awake with the first light of dawn. I dressed and prepared to face whatever havoc had been wreaked on the campground in the night. The trashcans on my side of the campground had not been tampered with. So far, so good. I saw a big pickup truck hauling a long livestock trailer on the other side of the campground. I saw bedding spread out on site #6 (but no tent). I saw a dog, and it saw me. I couldn’t tell if it was tethered in any way, but it didn’t run over to meet me, so I left well enough alone. I didn’t see any people moving around, but at the back of site #6, I saw six horses milling about. Oh! Horses! That was the animal noise I’d heard in the night. I don’t have much horse experience, so I wasn’t surprised I hadn’t identified the sounds I’d heard as coming from horses. I also figured the metallic sounds must have come from the trailer–the gate opening, the horses unloading. I did my paperwork so I could turn it into my supervisor later in the day. I swept the restrooms. I cleaned fire rings. I plotted how I would demand payment from the horse people, no mater if they protested that they’d not spent the whole night. They’d woke me (and scared me, no less), and they were going to pay. Between 6 and 6:30, I looked over to site #6 and saw some people moving around. When I finished with the fire ring I was cleaning, I grabbed my clipboard and walked over, fully intending to write a permit and collect payment. I noticed a person walking among the horses. The person had long hair; I thought it was a small woman. I also noticed the dog I’d seen earlier was not leashed and was frolicking around the horses. I think I said, Good morning, followed by, The dog does need to be leashed in the National Forest. The female person did not turn to look at me. The female person turned to look at me. I saw she was not a small woman, but a young girl, maybe 11, maybe 12. She looked at me in utter confusion. The dog, I pointed. A leash, I said. She didn’t utter a word. She seemed to be frozen. She just looked at me with blank eyes of confusion. I think there was something besides confusion on her face, but I didn’t realize it at the time. 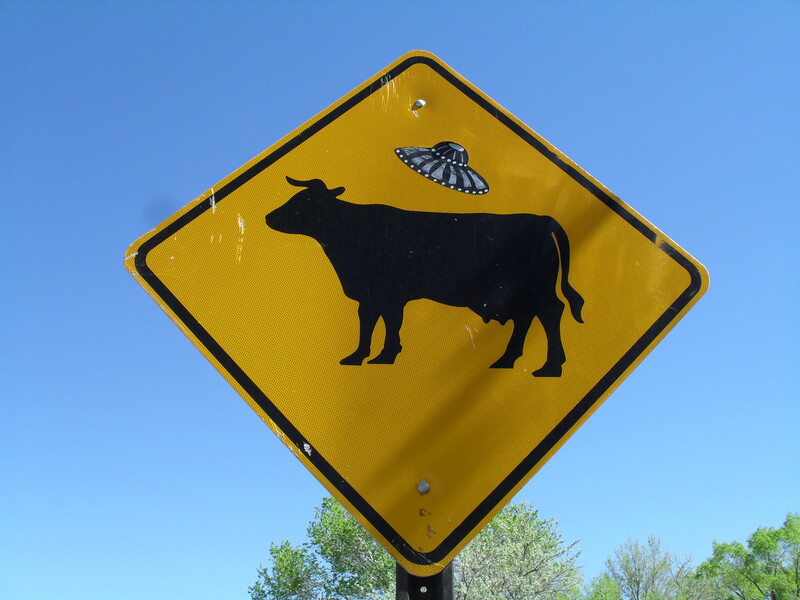 I took the photo of this sign, either warning cows of possible UFO abduction or warning humans that UFOs and cows use the same areas for crossing. Signs like this are seen throughout Taos County, New Mexico. For my day off on Tuesday, I went halfway to civilization where I pick up my mail. The post office is in a building with a restaurant, bar, general store, and gift shop. The building has internet access, so on my days off when I don’t want to deal with the heat and people in Babylon, I go twenty-five miles, buy a cup of coffee and a meal, and spend eight or nine hours using the internet. The food is decent (not great, but decent), and there’s one booth with an electrical outlet next to it. I’ve gotten friendly with the woman who’s the waitress and the cook all morning, and we chitchat a little when she comes by to see if I need anything. There’s never been a crowd any day I’ve been in there, so no one seems to mind if I take up a whole table for a whole day. It was after five o’clock when I packed up and headed out on Tuesday afternoon, so it was close to 6pm when I got to my campground. The first thing I noticed upon arrival was that the half of the gate still standing at the entrance to the campground was blocking half of the road. I stopped the van and got out to investigate. Sometime back (I don’t know when exactly), a huge tree fell and smashed half of the gate, which is meant to block the access road when the campground is closed in the winter. 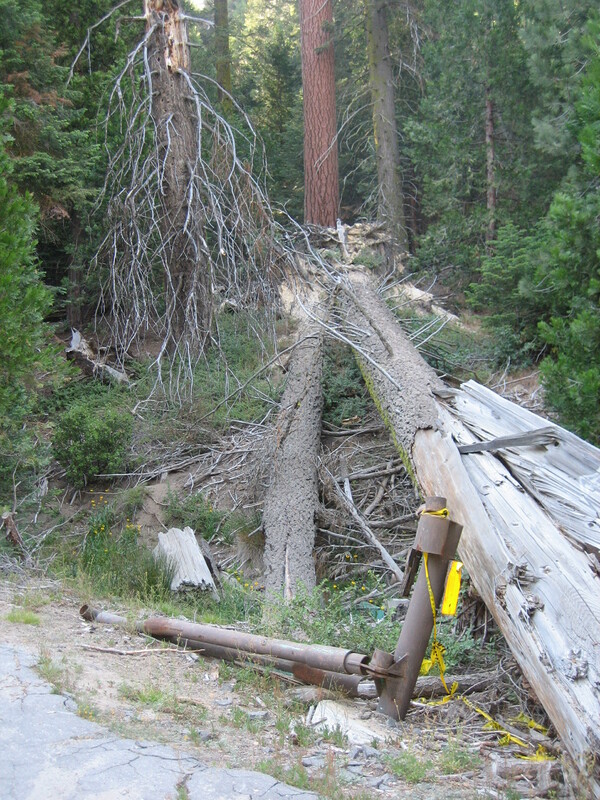 This photo shows the tree that fell and destroyed half of the gate into my campground. The brown metal pieces are the remains of the gate. The gate seems to have been made of strong and sturdy metal, and the tree just SMASHED it when it fell onto it. 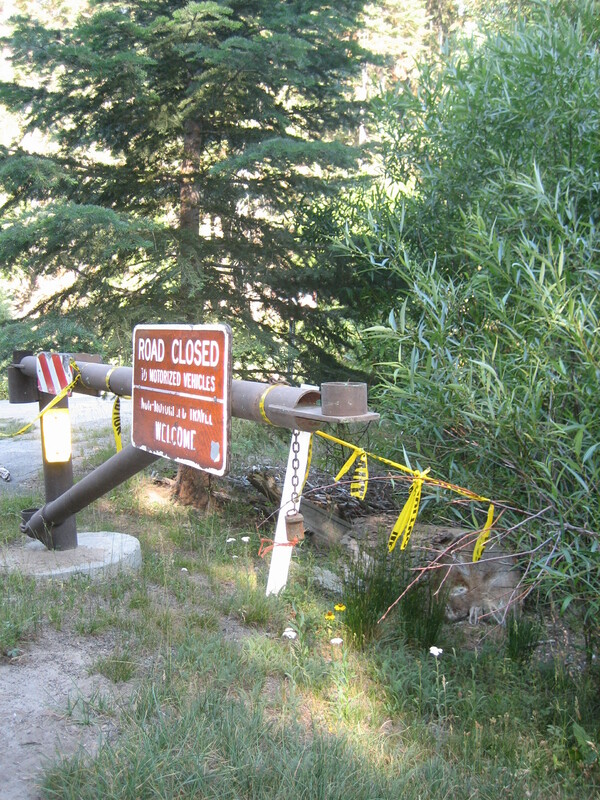 This photo shows the side of the gate that’s still standing and is tied to a thin-branched bush with yellow plastic “caution” tape. To hold open the half of the gate that’s still standing, someone had tied yellow plastic “caution” tape to the gate and to a thin-branched bush. What I found when I surveyed the scene was that the “caution” tape had broken and allowed the gate to swing across the road. I swung the gate out of the roadway and managed to tie the remainder of the tape to the gate, holding it out of the way. I’d only driven a little ways down the road when I looked to my left and in the meadow saw faces–cow faces! By cows I mean cattle. I’m guessing they were females because I don’t think bulls usually run around with the ladies, but I did not check bovine genitalia. There seemed to be a lot of faces staring at me, but I didn’t get a head count. I had an idea that if cows were in the meadow, their people must be in the campground, but when I got to the campground, I found it deserted. I wasn’t sure what to do. Bovine invasion had not been covered in our training. Was it ok for them to be in my meadow? Did I need to report their presence, and if so, to whom? I figured my best course of action was to drive the three miles back to the neighboring campground and ask the other camp hosts what I should do. The other camp hosts didn’t seem worried about the cows and said I didn’t need to report them to anyone. The man half of the camp host couple said he’d worked on a ranch. He told me these were half wild mountain cows who don’t see people much. It seems like they’re turned out to fend tor themselves during the dry summer months, then are probably rounded up for the winter. 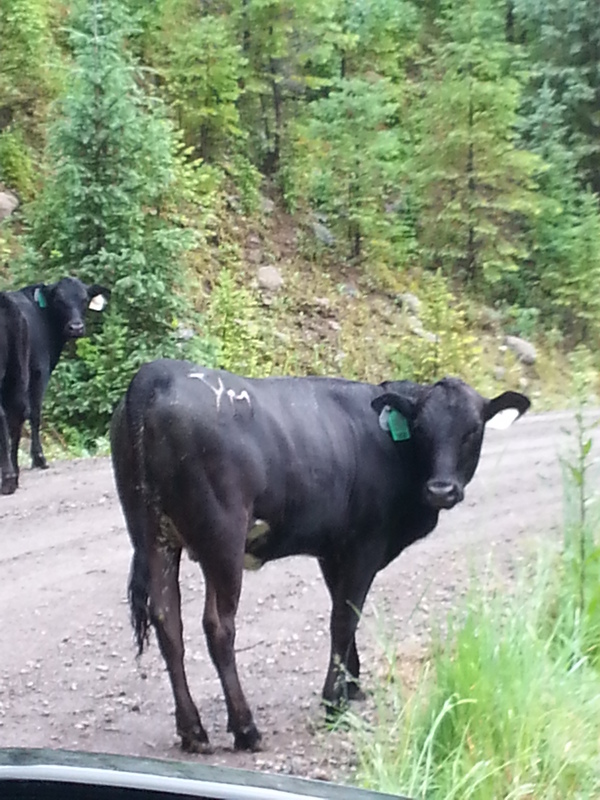 These are probably some of the same cows I’ve seen on the road on my way to and from the hot springs. The camp host man said I shouldn’t let myself get between a mamma cow and her calf. He said a mamma cow separated from her calf could be as dangerous as a mamma bear separated from her cub. He also said if the cows were bothering me, he’d come and chase them away. The cows were not bothering me. I just needed to know if I should report their location. And I’m not scared of cows! My uncle raised cows when I was a kid, and I’ve been around cows, petted them above the nose and between their eyes. I’ve even been licked by big sloppy cow tongue. And while I wasn’t going to trek into the meadow to try to pet a half-wild mountain cow, I think I could make enough noise to scare them away if they came up to my van and bothered me. The cows are actually rather shy. I wanted some photos of them to include with this post, so I grabbed my camera. Like reclusive Hollywood stars, they turned their faces, then shuffled into the trees on the perimeter of the meadow. Like a paparazza destined for failure, I gave up after a few blurry shots. 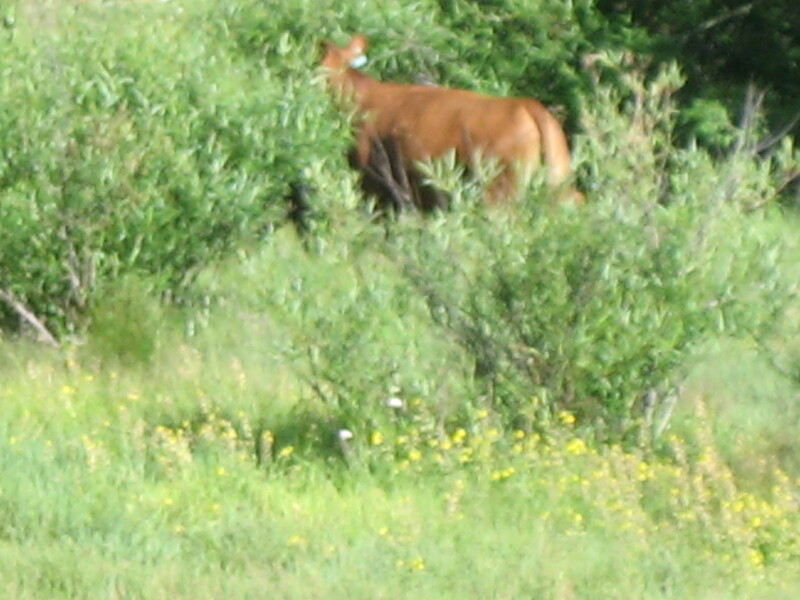 One of my blurry shots of shy cows. On Friday evening, a couple of young women (who were perhaps a couple) checked into the campground. I told them about the cows (which I had seen over the ensuing days but had failed to photograph). As the women headed to the meadow on a late afternoon walk, I heard noise from the area. The noise was too loud to have been caused by two skinny humans, so I figured I must be hearing the cows. 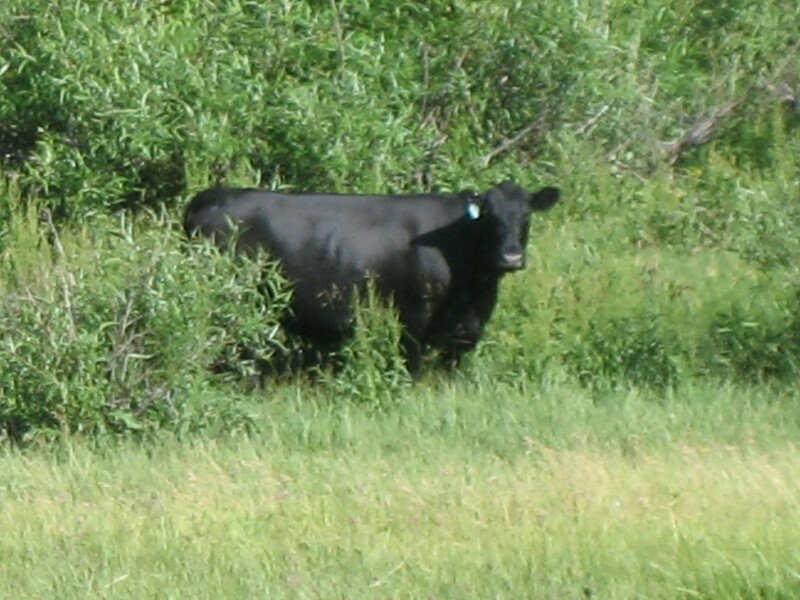 Sure enough, when I looked that way, several shy bovines were hustling into the trees, but one bold black one stood out in the open and stared at the two young women. As we all stood still, an amazing thing happened. Cow after cow came out of the trees. They strode away in single file. The cows in the line walked away slowly but purposefully. Where they were going, I don’t know, but they seemed to have a destination in mind. I didn’t dash to get my camera. I was afraid sudden movement on my part would cause cow consternation, and I didn’t want to upset anyone. Maybe I’ll get another chance at photos. Or maybe we’ll only have a couple of blurry cow photos to look at. 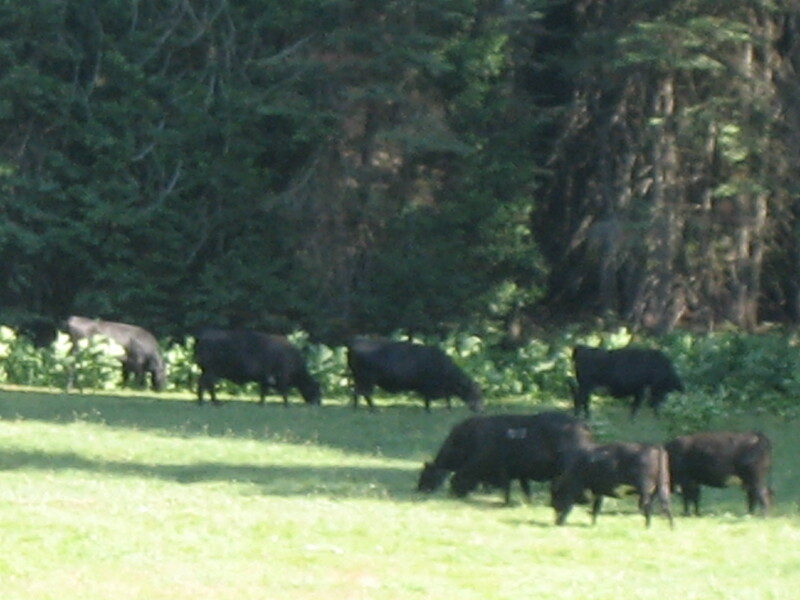 I took this photo of cows in the meadow a few days after the events written about in this post occurred. There were about twenty cows in the meadow when I took this photo. I had to use the zoom on my camera to get this shot. I could not get close enough to the cows to get better photos. Whenever they heard my footsteps, they looked up at me. If I got too close, the cows moved farther away. Two bold cows. 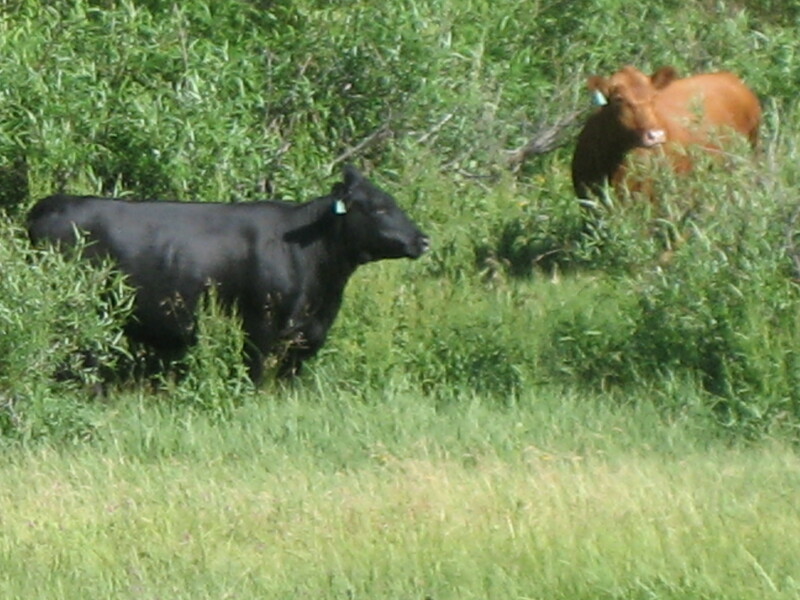 While most of the cows in the meadow were black, there were a couple of light brown ones. 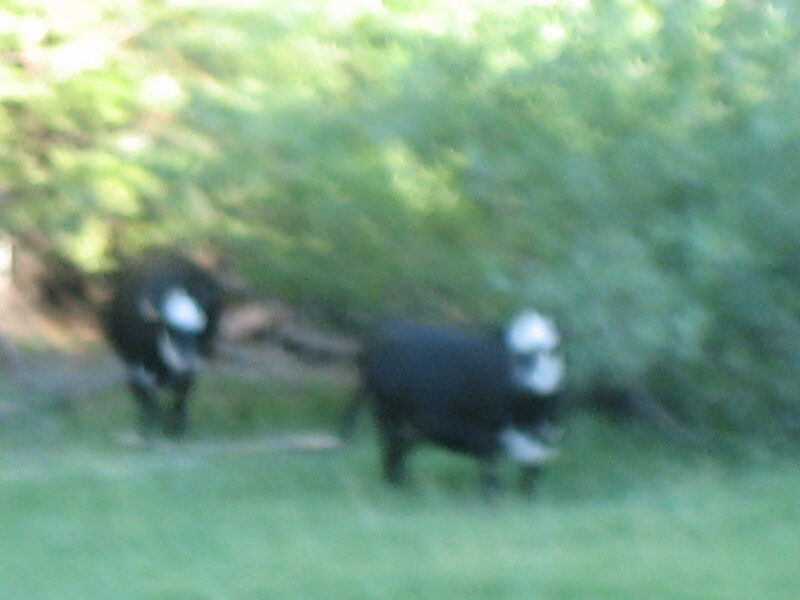 Some of the black cows had white faces. I saw a lot of cow butts much like this one while I was trying to take these photos. All photos in this post were taken by me.